How did what was supposed to be a mere two-part guest post get to be this huge? I think it’s what project managers call “scope creep.” 🙂 Essentially, the story demanded something more, and as with many of the things I write, it told me the shape it wanted to be in. Thanks to everyone who’s stuck with me through this very personal tale. If it touches you in any way, I encourage you to like, share, comment, or subscribe as your conscience dictates. I’ll take the opportunity here to remind everyone that while this story is based on my life, that it is filtered through my frame, and is, no more and no less than anything else I write, a story. Last week: I discussed some of the things that I do to keep the wolf of my depression from the door, or perhaps invite it in, let it curl up by the hearth, and make itself at home. This week I’m going to pick up the original thread of the tale where I left it. The years during which I was “growing up,” getting a job, and learning how to deal with my depression were largely fallow ones for me creatively. I got off to a good start in my undergrad years, both at Guelph and at Laurentian, but faltered during my struggle to achieve my master’s degree. Though my primary poetic publications, NeoVerse and Battle Chant, emerged around the time that I finally received my graduate degree, I found it difficult to continue writing. A handful of scattered publications in poetry and a short-lived foray into publishing weren’t enough to validate my still-fragile writer’s ego. I’ve never had a thick skin. As I slowly worked through my issues, however, I started to realize that writing wasn’t something I did or didn’t do. It’s something I am. My inability to commit to the writing life on a regular basis made me question my calling. If I couldn’t write, how could I call myself a writer? Maybe it was time to throw in the towel and commit to a life without magic. The sheer impossibility of that thought told me that writing was what I was meant to do. I just had to find my way to it without a map or any orienteering skill whatsoever. Upon my triumphant return from Windsor and contract jobs interspersed with unemployment, Phil and I decided to get a puppy. We already had two cats, one a three-legged refugee from my days at the Veterinary Emergency Clinic in Mississauga, the other a sweet-natured black cat that Phil got me for my birthday one year. I got my full time job with my current employer. Phil and I got a house and a car. I made use of my new benefits to get some serious work done on both my body and my mind. I figured out that medication was not the way to address my feral disease. My mother was still working, part-time at the local hospital, at home, taking care of my father, who had graduated to a disability pension and therapy, and at the seniors’ residence where my grandfather now lived. I went out with her to see my grandfather about once a week, and helped her to transport him to his various appointments. My father began to have issues with his heart, eventually diagnosed as arrhythmia and congestive heart failure. He got a pace-maker, and a new suite of medications. Shortly after retiring from the hospital, my mom developed diabetes. Dad started to fall. If it happened at home, either Phil or I, or both of us would have to help Mom, because Dad couldn’t get up under his own power and she couldn’t lift him. If it happened outside home, it generally involved a hospital stay. Dad was on Cumadin by this time and as a result, even the smallest injury could become serious due to the complications of the medication. It wasn’t something sudden. 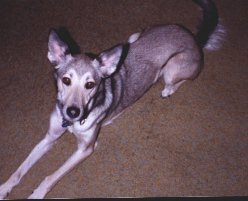 Zoe developed hemangiosarcoma and though we caught it early, the vet wasn’t able to catch it all with surgery and internal lavage. The issue with this particular type of canine cancer is that it likes vascular areas, that is, places in the body where blood vessels tend to gather, like the spleen and the liver. Once it takes hold, it disseminates quickly and almost always results in death. The biopsy taken in the surgery came back malignant. It would only be a matter of time. As it turned out, we only bought Zoe a couple of weeks. At first, it seemed like she was recovering. Phil and I had taken to sleeping on the futon in the living room so we could be close to her if problems arose. The morning she woke me at 5 am looking for comfort was her last. I won’t describe that morning other than to say that I called in sick. I was devastated. For the first time, I cried legitimately over the loss of a loved one. My maternal grandfather was the only one of my grandparents left alive. He’d been a hard-core smoker, and alcoholic for most of his life. When my grandmother passed away, he reacted poorly and within a few months, a fall resulting from TIA, landed him in the hospital. From there, arrangements were made to move him into a seniors’ residence and for many more years, he lived happily, adjusting to the fact that he couldn’t drive anymore, that he had to go outside the residence to smoke, and that he had to depend on my mother to ration him a few beer on special occasions. Some irregularities regarding his heart landed him in the hospital and when I got the call at work that I should come to the hospital, I had a bad feeling. In the time it would take me to get the car, drive to the hospital, find parking, and get to his room, I could walk, so I sped along as quickly as I could, hoping that he would hold on long enough for me to get there. Turns out he’d already passed away when I got the call. Papa’s passing wasn’t all that traumatic for me. He’d lived 94 years despite his addictions and was, so far as I know, happy. I also felt confident that I had been there for him as much as I could. I helped Mom settle his estate. Being able to help her out in that way made another big difference for me. I received a small inheritance, just enough to invest in my first laptop computer. That year, I started to get back to my writing and the novel I’d conceived of all those years ago in university. In another year, Phil and I felt that we could bear the love of another pup. That was when we got the Nuala-beast. Though I was writing more, I wasn’t writing daily yet. It wasn’t until Nino Ricci came to town to do a workshop with the Sudbury Writers’ Guild that my head got turned around the right way on that. It was his sharing of his own guardian tale that helped so much. Every writer has at least one, that big name, well-established Author who tells you that your work is crap. The breakthrough was that I could choose not to let the well-meant, but unfortunate words of my guardian keep me from entering the inner sanctum and gaining my prize. Productive or not, I’ve been writing every day since, and that, as the poet said, has made all the difference. 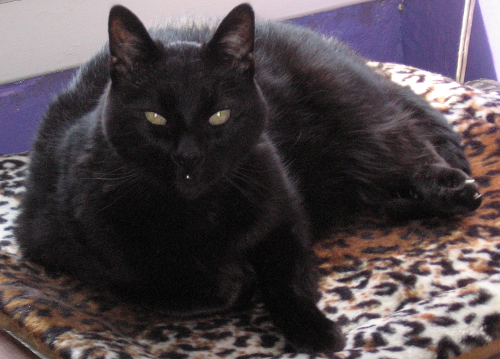 Our little black cat, Thufir (named after the Mentat Thufir Hawat due to his fondness for flashing lights) developed feline diabetes. Phil and I were surprised because he wasn’t obese or showing any of the other signs, but his blood glucose level didn’t lie. He was on Metformin for a year and graduated to insulin after that. I became very adept at taking his blood sugar levels and injecting him daily. He came to tolerate, if not anticipate his injections, like he knew that they made him feel better. Once again, however, it was a matter of time. Eventually, organ failure took out little guy. I wasn’t sad this loss either. I’d been the best kitteh-mama I could have been and I knew that I’d done well by him. I’d kind of made my peace with death by this time. I’m going to leave things here for now. The next big event for me was the death of my father, and that’s going to need a post unto itself. After that, I’m going to delve into my insights into happiness as a result of all I’ve learned and that will be the culmination of the series. Tomorrow I’m going to be writing the Wordsmith Studio Anniversary post 🙂 What’s that, you ask? Read and find out, my friends. Coming soon: I have a few wonderful authors who have agreed to do interviews for little ole me. Look out in the next few weeks for six questions with fantasy author J. L. Madore, poet Barbara Morrison, and D. J. McIntosh, author of The Witch of Babylon, and the soon-to-be-released The Book of Stolen Tales.